We provide childcare which is not only committed but based on sound ethical, environmental and moral values, which enable both children and staff alike to work to the best of their ability. Our committment is to provide a warm, happy, friendly enivornment where each child is encouraged to reach their full potential through praise, sensitivity and mutual respect. We continue to maintain our excellent reputation for a well organised, aesthetically pleasing environments, where you leave your children, knowing they will receive the highest quality childcare and education. The schools are all based on the teachings and philosophies of Dr. Maria Montessori. We welcome children from 1-1/2 through to to the age of 5 including half-day, full-day, after school club options plus a summer camp during the months of June to August. For more information feel free to Contact Us. 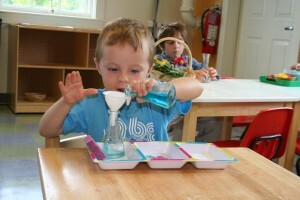 Our Montessori program has been enhanced with Stretch n’ Grow, arts and crafts, science, music and drama. This provides for a well-rounded early childhood care and educational experience. We are also registered and participate in the free preschool year ECCE Government Scheme. All children, who are aged between 3 years and 2 months and 4 years 6 months on 1st September 2010 are eligible to join the scheme. 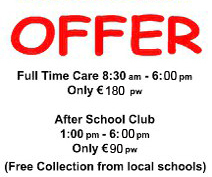 Contact Mary Coyne on 087 911 4482 or email tirnanog63@hotmail.com to arrange an appointment to view our school and secure your place on the scheme.